As noted, we attended my sister's wedding this weekend. My sister's cats were there, including Izzy. We don't have much detail on Izzy, except like any Heisen cat, she refuses to pose for a camera. In her case, she refused to even look at Katherine until after the camera's battery died. Does Izzy have six toes instead of five? Her paws look kinda... weird. Isadora Duncan Derbyshire Rudy will be two years old on August 1, 2004. 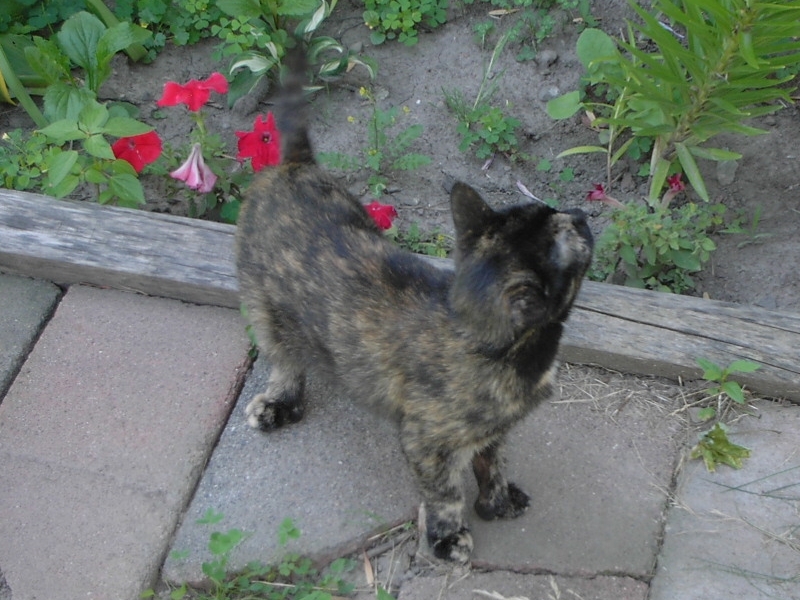 She is a petite tortoiseshell with seven toes on each of her forepaws. Maynard Keenan Derbyshire Rudy will also be two years old on 8-1-04. (He and Izzy are litter mates.) He is a large black male with a small white slash on his chest. He curls up at night with me and lets me hold him just like a teddy bear.